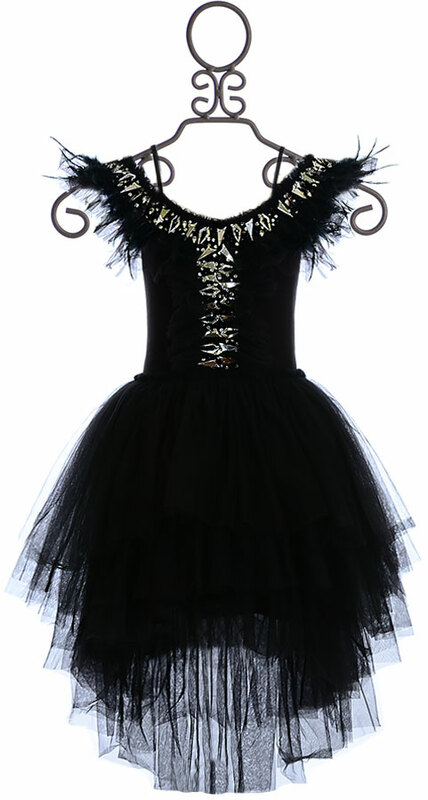 $144.8 - She is sure to make a splash at any Halloween event with this designer girls dress from Tutu Du Monde. The black crow is a style that effortlessly blends elegant with a touch of spook. The bodice features an off the shoulder style with thin straps supporting the look. Layers of tulle and boa features line the neck while dressed up with silver gems. The same look falls down the front. The long skirt adds to this drama. The black tulle layers beautifully and ends with a high low hemline. Professional Dry Clean Only!